Nearly eight months ago, my wife and I became foster parents to two sisters, who are 19- and 2-months old. The experience has been rewarding, of course, but I’d be lying if I didn’t admit that it also has been hard. We used to be able to pack our son into the car and go on extended road trips. We don’t do that anymore. We used to be able to go out for date nights. That’s now a rare occurrence. We used to get a full night’s sleep. Now, we wake up two to three times a night to feed someone else’s baby. 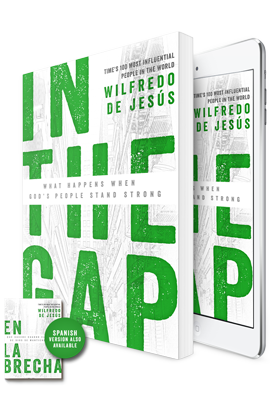 “A gap,” Wilfredo De Jesús writes in his new book, “represents a place of weakness, vulnerability, and danger. It is a defenseless location of exposure and limitation, a point where people face real threats.” My foster daughters were “in the gap,” so to speak, when they came into our home. It fell to my wife and me to stand in the gap for them and become a source of strength, health, and safety for them. As I read about these biblical characters, I realized that my feelings of inadequacy, loss of comfort and ease, and occasional desires to throw in the towel were not unique to me. If you stand “in the gap,” you put yourself in harm’s way, you make your life more difficult, and you experience crises of faith. But you also—and this is the most important thing—do what God wants you to do by trading your comfort for the wellbeing of others. Isn’t this what Jesus—the Ultimate Gap Man—meant when he said, “the Son of Man did not come to be served, but to serve, and to give my life as a ransom for many” (Mark 10:45)? Please don’t misunderstand me. I don’t think my wife and I are heroes. I know us all too well—our struggles, doubts, and frustrations—to say anything so arrogant. Indeed, I ask myself why it took me so long (I’m 45 years old) to stand in the gap for little children whom Jesus loves and blesses. Rather, I share my story in order to explain why I profited from reading this book. This book encouraged me to keep on doing whatever I can do to make my life a blessing for others, especially those in places of weakness, vulnerability, and danger. I hope, when you read this book, it will have the same effect on you. In the Gap includes discussion questions at the end of each chapter, which can be used for personal reflection or group discussion. It has a self-evaluation tool at the back of the book to help you determine “where God is already at work in your life…and where He may need to do a little more to sharpen and shape you.” Finally, it includes useful suggestions for how to use the book in small groups and classes.